The musée du quai Branly-Jacques Chirac , in Paris, France, features the indigenous art and cultures of Africa, Asia, Oceania, and the Americas. The museum collection has 450,000 objects, of which 3,500 are on display at any given time, in both permanent and temporary thematic exhibits. A selection of objects from the museum is also displayed in the Pavillon des Sessions of the Louvre Museum. The Quai Branly Museum opened in 2006, and is the newest of the major museums in Paris. It received 1.3 million visitors in 2015. It is jointly administered by the French Ministry of Culture and Communication and the Ministry of Higher Education and Research, and serves as both a museum and a center for research. The Musée du quai Branly is located in the 7th arrondissement of Paris, on the left bank of the Seine, close to the Eiffel Tower and the Pont de l'Alma. The nearest métro and RER stations are Alma – Marceau and Pont de l'Alma. The museum contains the collections of the now-closed Musée national des Arts d'Afrique et d'Océanie and the ethnographic department of the Musée de l'Homme, plus ten thousand recently acquired objects. The permanent collection has 300,000 works, 700,000 photographs, 320,000 documents, 10,000 musical instruments, and 25,000 pieces of textile or clothing. The main collections area displays about 3500 objects, rotating 500 each year. The museum has both permanent exhibits and large exhibits which change every six months. The museum also has thematic exhibits featuring masks and tapa cloth from Oceania, costumes from Asia, and musical instruments and textiles from Africa. Temporary exhibits at the Museum touch upon a wide variety of subjects and themes. Themes of the exhibits in the summer of 2014 included the history and culture of tattoos, propaganda posters from Vietnam, and an exhibit about the influence of the culture of Oceania on American popular culture in the 20th century. This last exhibit, called "Tiki Pop", featured films, posters, music, clothing, and a recreation of a Polynesia-themed "tiki bar" from the 1960s. The museum has notable collections of objects from gathered during the French colonization of North America, from Quebec to Louisiana, in the 17th and 18th centuries, and also on the role of women voyagers in the 18th and 19th centuries. It also has a notable collection of paintings by Aboriginal Australians, in particular paintings made on eucalyptus tree bark. A small selection of the collected objects of the museum is regularly displayed in the Pavillon des Sessions of the Louvre Museum. The museum complex has four buildings, occupying 30,000 square metres (320,000 sq ft), which, along with the garden, cost 233 million euros to construct. The main building containing the galleries of the museum is 210 metres (690 ft) long and covers 4,750 square metres (51,100 sq ft), and has a 3,000-square-metre (32,000 sq ft) terrace on the roof, the largest roof terrace in Paris, which also has a restaurant and mediatheque. It is constructed like a huge bridge, ten meters over the garden, supported by two large concrete silos at the east and west ends and by twenty-six steel columns. As the trees of the garden around the building grow, the columns will be completely hidden and the building will appear to be resting on the treetops. Visitors enter the main building through a small entrance, and then follow a winding ramp up a gentle slope to the main gallery, two hundred meters long. The main gallery is dark inside, with a small amount of sunlight entering from outside, and with direct lighting only on the exhibited objects from the permanent collection. Thirty different galleries are placed on the north side, which are visible on the outside of the structure as boxes of different colors. Three mezzanines look down on the main gallery; the center mezzanine is the multimedia center, and the other two mezzanines are used for temporary exhibits. The west mezzanine has a new exhibition every eighteen months, while the exhibition on the east mezzanine changes each year. The garden side of the building contains an auditorium, classrooms, lecture hall and restaurant. The Branly building contains administrative offices, and has one hundred forty work spaces on five floors. 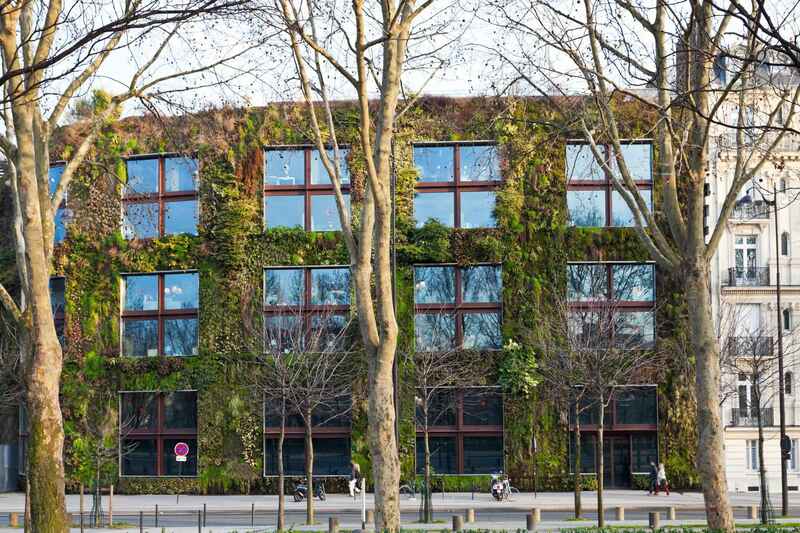 Its most unusual feature is the green wall, or wall of vegetation, composed of living plants, on the north side of the building, facing the Seine. The Auvent building, connected by footbridges with the Branly building, has sixty work spaces, and houses the Jacques Kerchache lecture hall and an archive of 700,000 photographs and sound recordings. s workshops and library. The ceilings and facade of the building are decorated with the works of eight contemporary artists, four men and four women, who are Australian aborigines. The Theater, situated under the hall and accessible since the garden was designed by Jean Nouvel with the cooperation of ducks scéno for the scenography and Jean-Paul Lamoureux for it acoustic. The space allows several configurations thanks to acoustic curtains conceived by Issey Miyake. In the original project for the museum, 7,500 square meters of the 25,000 square meter site were set aside for gardens. 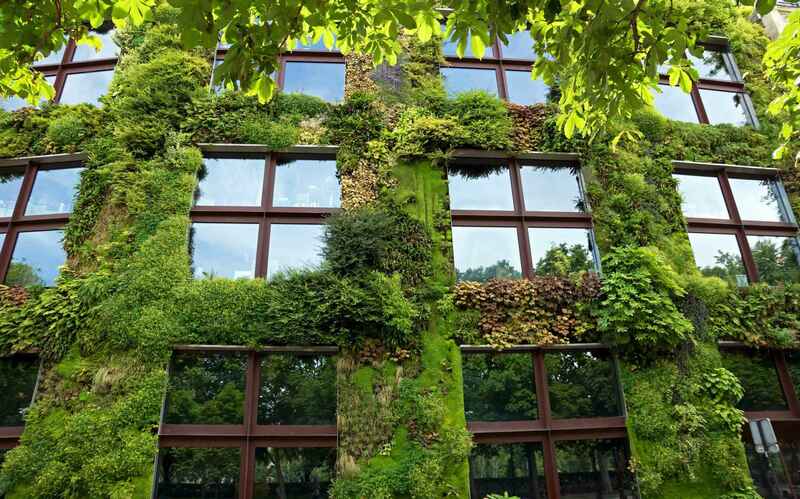 The winning architect, Jean Nouvel, increased the size of the gardens to 17,500 square meters. The gardens were designed by landscape architect Gilles Clément, They were designed to be the exact opposite of a traditional French formal garden; there was no fence, no lawn, no gates, no monumental stairway; instead, Clément composed a tapestry of small gardens, with streams, hills, pools, and groves, using the native French plants and imported plants accustomed to the Paris climate. On the north side, facing the street along the Seine, the garden is protected by a high double wall of plate glass, which blocks most of the sound from the street. The gardens on the north side practically hide the museum building. Instead of straight paths and a long axis to the entrance, the paths wind through the gardens, with no apparent destination. The gardens contain 169 trees and 72,000 plants. A notable feature of the Museum garden is the green wall, or wall of vegetation, created by botanist Patrick Blanc. The living wall of greenery covers 800 square meters of the facades of the museum, and 150 square meters of the interior walls. It includes 15,000 plants of 150 different varieties, coming from Japan, China, the Americas and Central Europe. The library also holds collections from important ethnologists, including Georges Condominas, Françoise Girard, and Nesterenko, as well as that of art collector Jacques Kerchache. Musée du quai Branly | eTips Inc.